It's not just a hive, it's Bee Furniture! 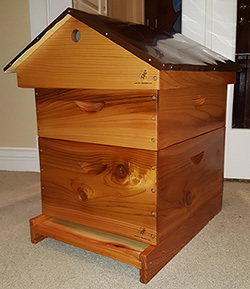 We design and build hand-crafted honey bee hives from carefully-selected pine, spruce, and Vancouver Island grown Western Red Cedar. Each piece is cut, assembled, and finished with an attention to detail and a mind for quality, longevity, aesthetics, and most of all, the overall health of your honey bee colony. Our equipment is created in such a way as to increase ventilation in the hive, which helps maximize overall bee health, especially in our temperate but extremely wet West Coast winters. As a beekeeper, Certified Bee Master and craftsman, it would be my pleasure to show you the difference that Bee Furniture makes! You have a choice - why not beautify your yard or apiary with hand-crafted Bee Furniture? Starter Kit - ideal for new beekeepers! 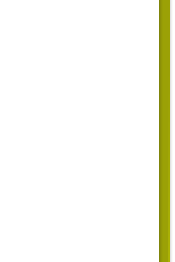 Are you a new beekeeper? Our Starter Kit is made with you in mind! Each kit comes fully assembled, finished, and ready to use. The kit includes a Screened Bottom Board with slide-out mite inspection tray, Deep Brood Box, Honey Super, vented Inner Cover, and our own design of peaked, vented outer cover with metal top. All components are hand-crafted right here in Nanaimo, BC Canada! We also stock all the basic supplies you'll need to get started. Check out our Accessory Packages here! Every home, even your bees' home, needs and floor and a roof. Find bottom boards, inner covers and outer covers here. All about our western red cedar! We started out making beautiful, strong Bee Furniture using locally-sourced Pine or Spruce lumber. Pine and Spruce are easy to work with, light, strong, and very reasonably priced, so it was an obvious choice. After the first year, I sourced a small supply of beautiful, Vancouver Island grown Western Red Cedar, and was able to build a few custom orders with it. Cedar contains natural resistance to rot and pests, so not only will it typically last longer than many other woods, but it also weighs less. The biggest benefit, in my opinion, is the naturally warm colours and grain characteristics; cedar can be anywhere from a light yellow through browns, reds, even purple and blue. I now work closely with suppliers who mill, just for us, some of the most stunning cedar we've ever seen! And this isn't just regular wood - it's sustainably grown and harvested, usually just a tree or two at a time. Often these trees have to be removed from residential lots for safety reasons or to make room for expansions, so rather than ending up as firewood, it's carefully removed and milled specifically to our specifications. This not only gives us the best possible wood, but reduces waste at the same time. We pay a little more, but we think keeping our old-growth forests intact is worth every penny. Most of our regular products are now also available in Western Red Cedar for just a little more, and like all of our products, each piece comes fully finished with four coats of bee-friendly tung oil, and is ready to use. We spend considerable time designing what we feel is a superior bee hive, and are continually evolving to create products that promote colony health. To learn more about what makes Bee Furniture, better, click here! 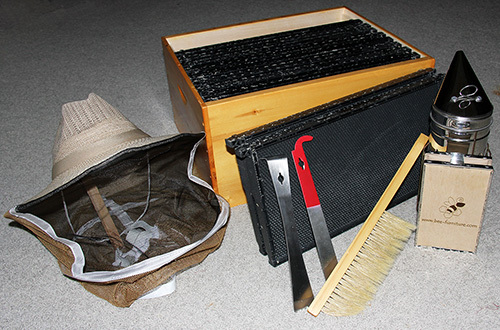 We now stock a comprehensive selection of most basic beekeeping supplies, including frames (plastic or wood), foundation (wax or plastic), hive tools, smokers, hats with veils, queen marking tools, queen excluders, etc. Click here for pricing and more info!